Most marketers know by now that blogging for business is essential, but, has your company made it a top priority? Not only will a company blog generate more indexed pages and opportunities for you to get found in search engines, but research shows, you can earn 67% more leads than those who aren’t blogging as well. A company blog is an online publication of short-form articles used to communicate news or insights to a business' customers and audiences. It is not just a cost effective way of discussing your product or offering, but also a valuable medium for educating your audience to make more informed decisions in regards to it. It's about creating a trusted resource that people can rely on to deliver factual, relevant information. Whether you’ve been consistently blogging everyday for the last decade, once a week, or you’ve made the decision to start it’s important to create a community where your audience wants to keep coming back for more. That means not only creating valuable content, but creating a positive experience for consuming it. 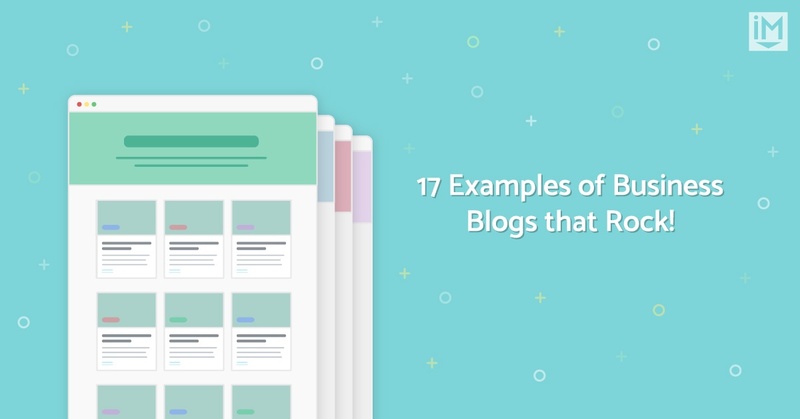 To do that, here are 17 great examples of blogs that have already achieved that. Find out how to drive more traffic to your business blog with helpful tips and tools. 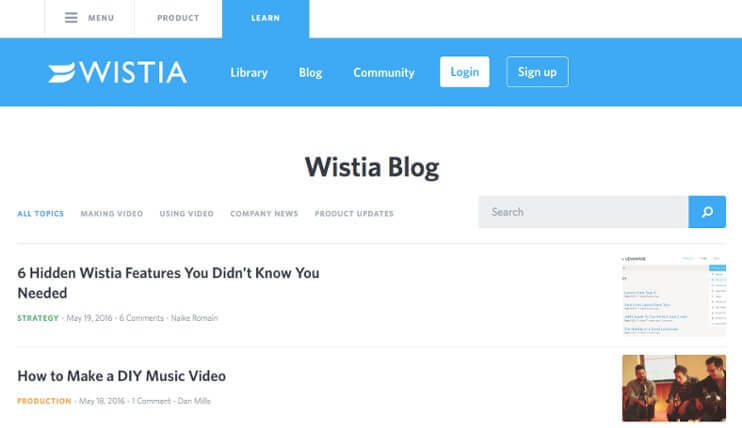 When it comes to video and inbound marketing, Wistia is your go-to resource. As a consumer, everyone wants something that's interesting, engaging, educational, and fresh; what about watching a video? Video is a more dimensional way for you to show your audience your personality and convey the passion and knowledge you have for the industry. With a team that’s dedicated to educating others on the benefits and importance of video, the Wistia blog will teach you: why you should make video part of your content marketing, how you can incorporate video into your marketing automation, and other great tips and tactics to help your company stand out from the rest. The era of post-it notes is coming to its end. With an increased focus on technology, apps are increasingly becoming the preferred method for taking notes for thousands of people. Note taking apps like Evernote help you simplify the complications in everyday life. I mean, no one wants to forget an anniversary or birthday. 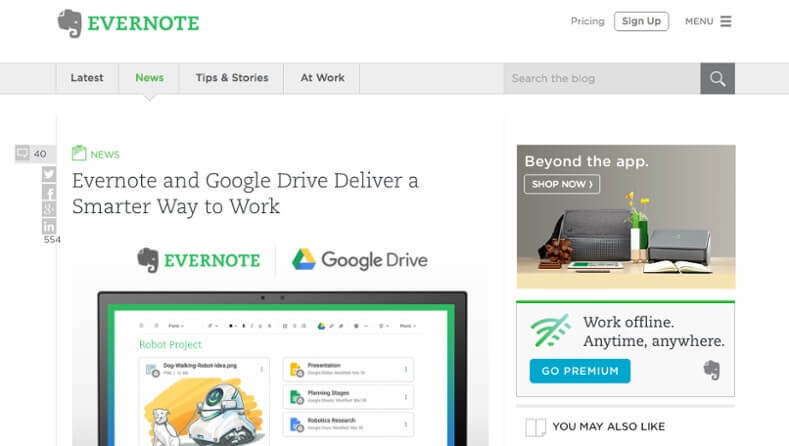 With content that’s tailored to helping make you more productive at home and at the office, you’re sure to find something that fits your needs on Evernote’s blog. Like how you can spend less time in meetings and more time getting work done. As an influential thought leader, you want to your blog to create a discussion. When seeking knowledge and advice from the industry’s top wizards, doctors, and experts on SEO, you will notice the amount of social media engagement, as well as the comments left by readers. Moz isn’t just creating content for the purpose of having content. They’re using their blog to educate and interact with members of their community. The readers are asking questions, looking for advice, and being educated. Readers see Moz as an industry leader. If the great outdoors are your second home, you’ve probably landed on REI’s blog once or twice -- or you might even be subscribed. Either way, if you think you’re only going to find articles about camping there, you’re wrong. 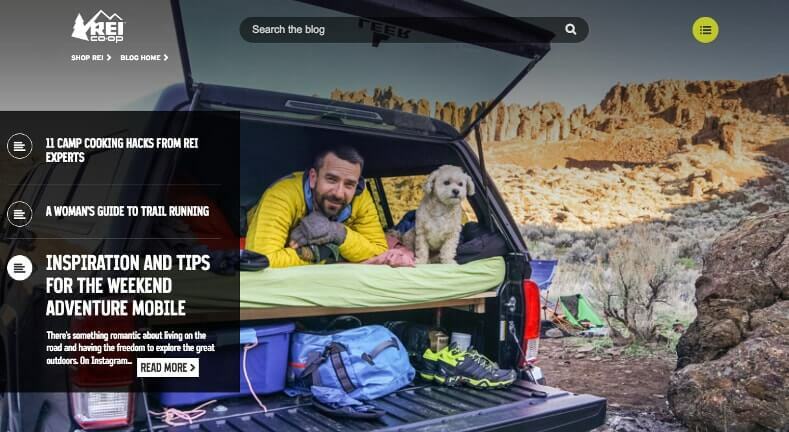 REI does an all around great job utilizing their blog. 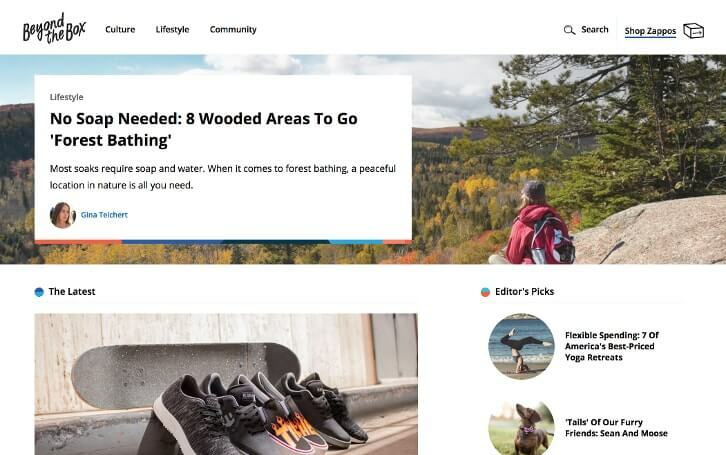 As an outdoor clothing, gear, and footwear company, their blog provides tips, comparisons, and step-by-step guides for everything from hiking, cycling, traveling, to even camping. They’ve built a platform that absolutely resonates with their audience and customers. Whether you’re a thrill seeker or simply enjoy hiking or cycling, REI is there to help you focus on your adventure. My favorite part of their blog would have to be the rate this story section that’s prominently placed next to the article’s title. This definitely kicks social proof up a notch! If you're looking for insight from the best and most creative entrepreneurs, First Round Review delivers. With content ranging from sales and design, management, people & culture, and even product, you’ll find a diverse mix to keep you coming back for more. My favorite part about their blog would be their focus on long-form content, featuring advice from industry leading companies and thought leaders. If you aren’t creating long form content, you should because they get more shares, are great for SEO, and increases conversion rates. If you thought their blog was only going to talk about shoes, you’re sorely mistaken. Instead of Zappos’ blog being a place for promotions and company news, they transitioned it to an outlet for inspiration and everyday life. With everything from their culture and style to active lifestyles and kids, you’ll find something that takes you beyond the box. We may be a little biased, but this blog has it all! 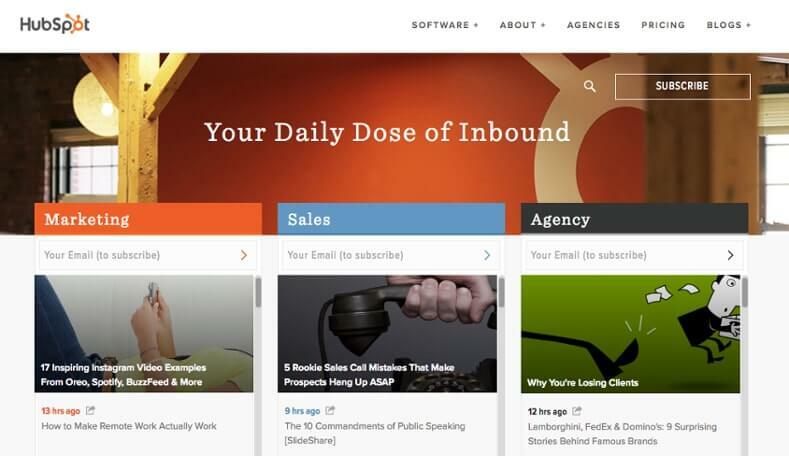 HubSpot has done a fabulous job creating a blog that anyone in business can love. Whether you’re looking for inbound basics to sales, product info, or even agency insights, you’ll find all of that under their main blog homepage. 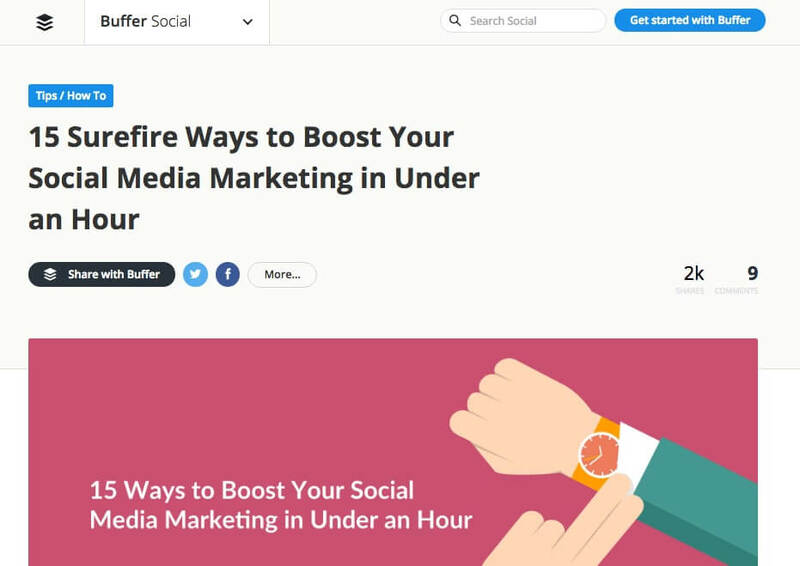 For those of you that haven’t noticed, Buffer recently switched things up with their new blog design. This search features definitely comes in handy if you have over 900 posts around a particular topic. 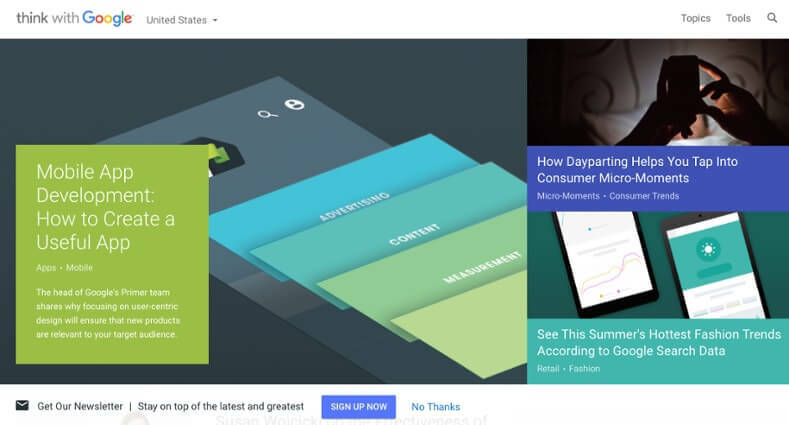 A design element they’ve included is various page templates for their content. A blog isn’t one size fits all. 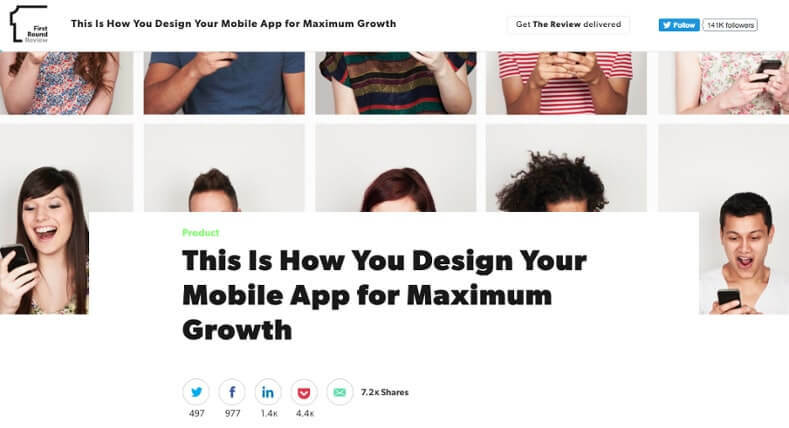 Depending on the type of post, the design layout allows them to tell stories more effectively through the help of two different article formats. Their making content adaptable to serve different purposes. The two layouts include toolbox articles (geared to support tip articles) and magazine articles (full-width background photo used for editorial-lead posts). 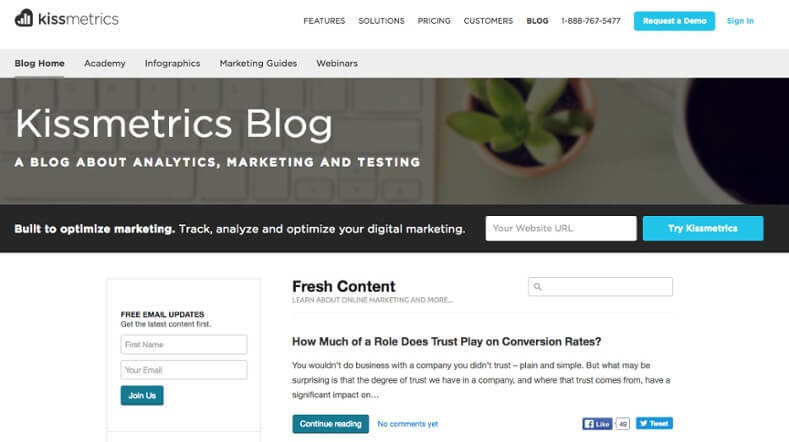 With a platform that’s built to optimize your marketing for conversions, Kissmetrics uses their blog to inform you about tracking, analyzing, and your strategy to do just that. Not only do they implement the basics such as great calls-to-action and inbound links, but they capitalize on long-form content -- giving you all the information you’ll need about one topic, in one place. Not only will you learn how to optimize your glassdoor account, but how to improve your interviews, the best ways to reject a candidate, and why working from home is good for your employees. 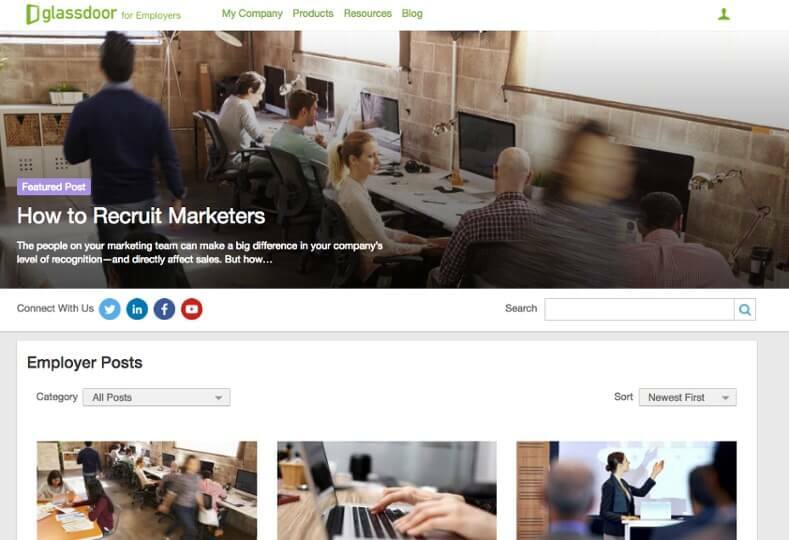 Like other blogs mentioned, Glassdoor also recommends resources you might be interested in. Making it easy for you to move through their site. Whether you’re a designer by occupation or a marketer looking to expand your visual impact, Canva’s Design School blog is here to help you improve and offer some inspiration. Their blog isn’t only about how you can do things, it also provide tactics and new ideas to improve your marketing and social media strategy. 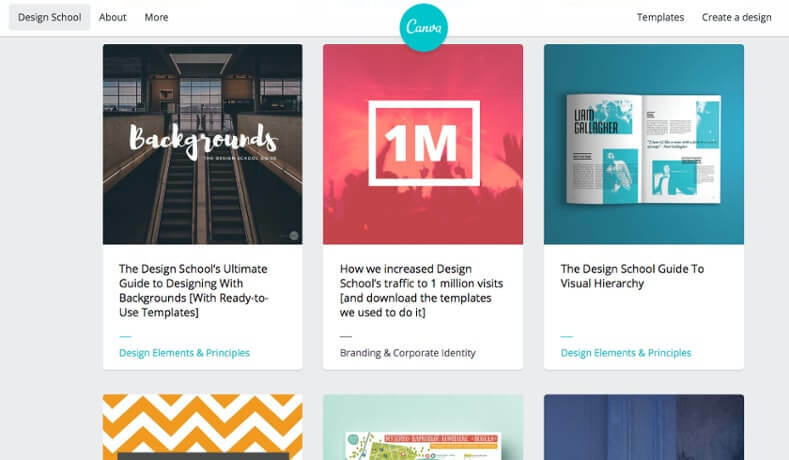 Canva is empowering the world to design. And, they also want you to subscribe! By offering a copy of their complete guide to branding and design, for free. With powerful call-to-actions, awesome feature images, a lot of engagement, ClearVoice has all of the basics covered. They also added a great toolbar at the top of their blog allowing readers to easily share content with their networks no matter where they are the on page. No one wants to search for the social share icons. 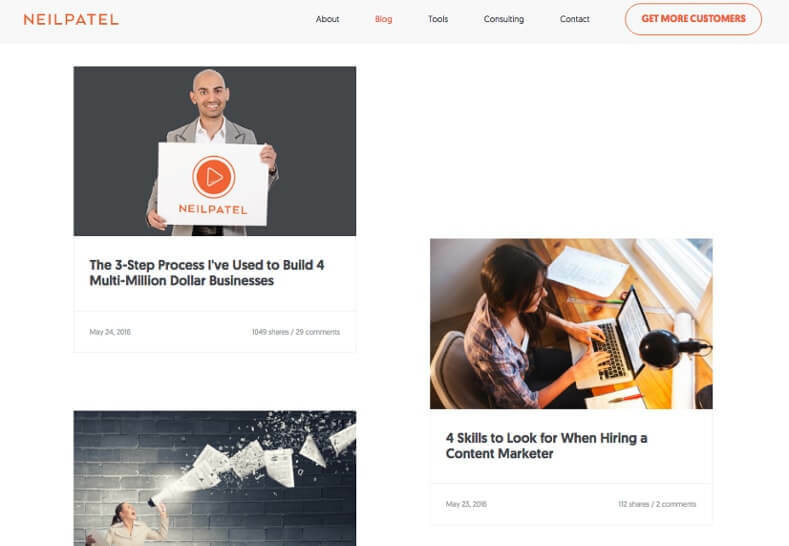 Anyone in inbound marketing knows Neil Patel has a GREAT blog! Through compelling images, thought provoking content, and clever call-to-actions, Neil has done a fantastic job of creating a great blog and resource for those in inbound marketing. To be seen as an expert in your industry, you content needs to reflect that and be thought provoking and knowledgeable -- educate others. Don’t forget to make your blog personal, you want to be able to make a connection with your readers, as well as write about topics your readers will be interested in. For all the creatives and developers out there, Smashing Magazine creates top of the line content to help you stay ahead of the curve -- especially in this fast pace industry. Through long form content, the contributors on Smashing are sharing their knowledge with the hope of stimulating creativity and strengthening the web design community. As a platform, you’ll find a variety of different voices that are sharing thoughts and ideas with the community. Not only do they highlight related articles you might find interesting, they also point you in the direction of additional articles and resources on the same topic. Google wants to help you put their research and insight behind your thinking. 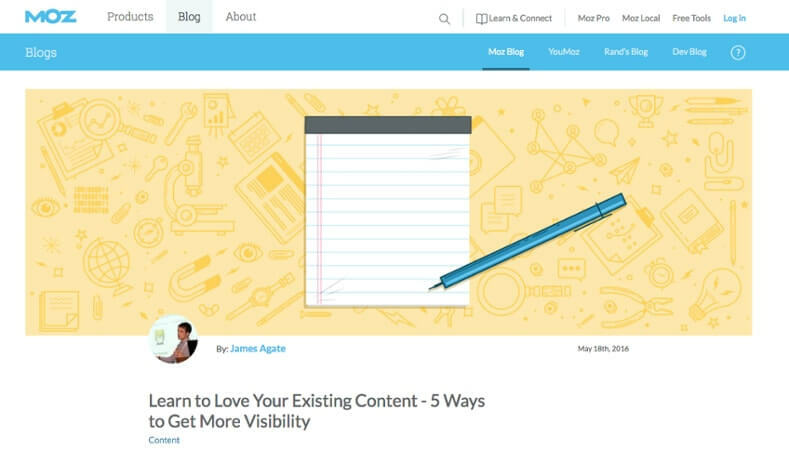 With a Mashable type layout and flow to their blog, you’ll be sure to find helpful content easily and without fumbling. 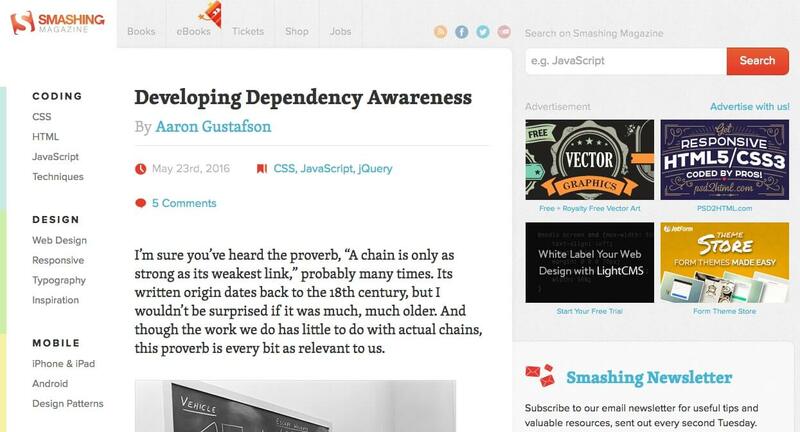 An interesting element they implemented within their blog is the ability to download an article. Don’t have time to read an article now? Or you want to share it with team members? It’s as easy as downloading a PDF version and sending it along. Groove takes an interesting approach to the layout of their blog, creating a timeline effect while maximizing the use of white space. One thing I enjoy about their blog is the subscription popup that comes down from the top of your screen. 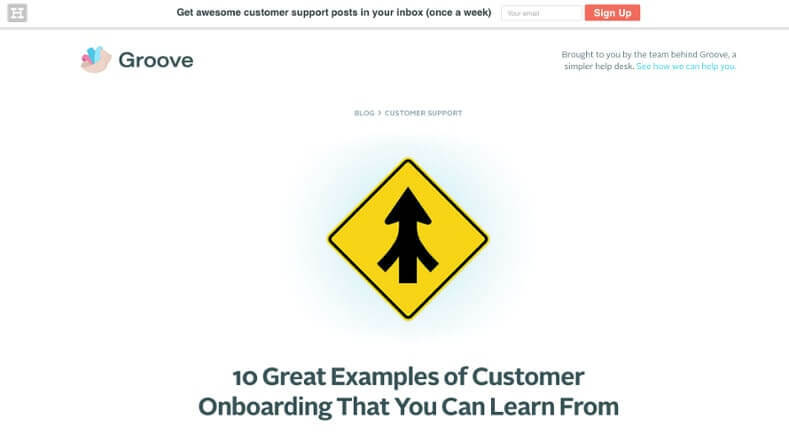 This makes it easy for you to receive their awesome content directly to your inbox. 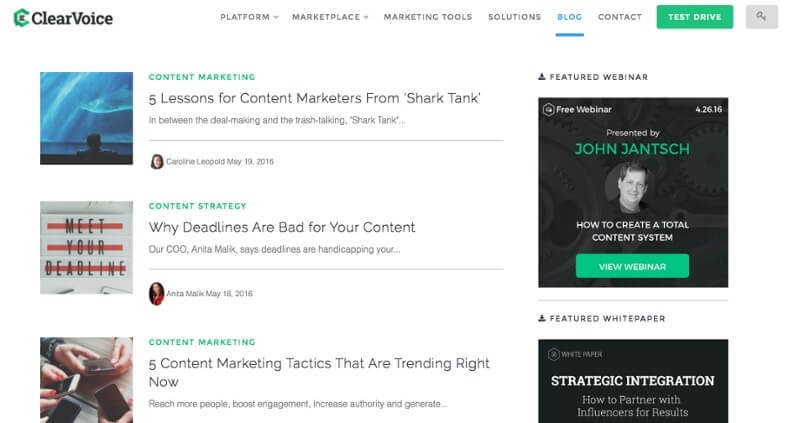 They also make it extremely easy for their readers to find similar content to the posts they’re reading. At the end of each post is a “you might also like” section where they highlight three articles to continue the reader’s journey. As a company that implements virtual desktop infrastructures, Information Technology Group (ITG)’s blog provides tips, comparisons, and step-by-step guides to help its readers make informed, educated decisions. You might be wondering how a company that provides IT planning, setup and management services has such a great blog. Their blog includes ALL of the basic elements that a great business blog would consist of: it’s regularly updated, has awesome featured images, compelling call-to-actions, great content, and a strong subscription box. Especially today, keeping your data and information safe is critical, so ITG’s blog is amazingly relevant and useful. Follow it if you’re thinking about implementing Windows 10, installing a virtual desktop or looking for tips on how to keep your passwords secure.